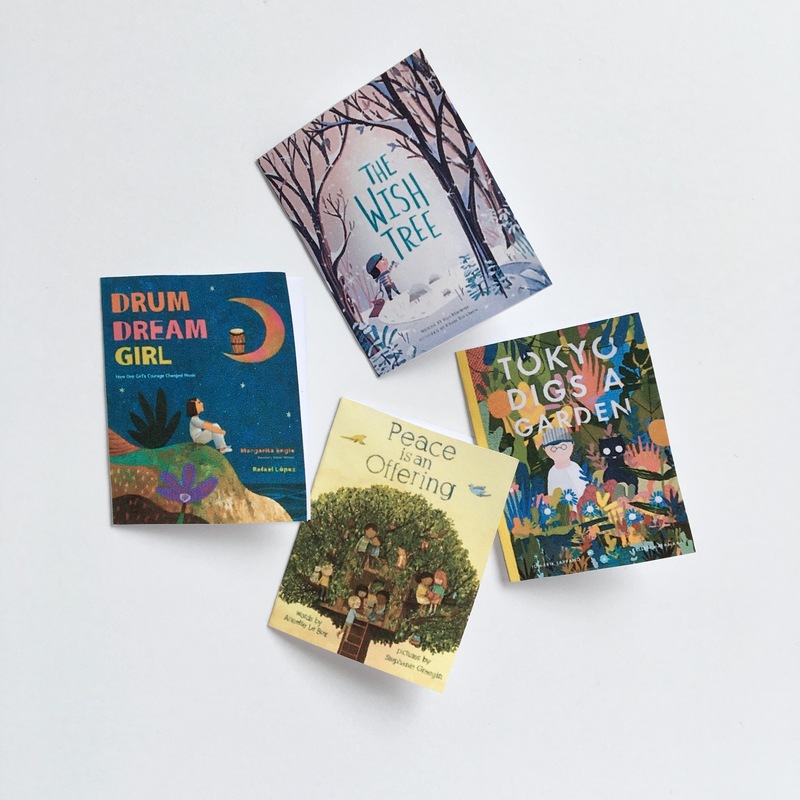 The Wish Tree by Kyo Maclear and Chris Turnham (2016) is a wonderful book about a boy named Charles looking for a wish tree in the woods while accompanied by his sled, Boggan. It’s a book about journeying, about wishing, and about kindness. 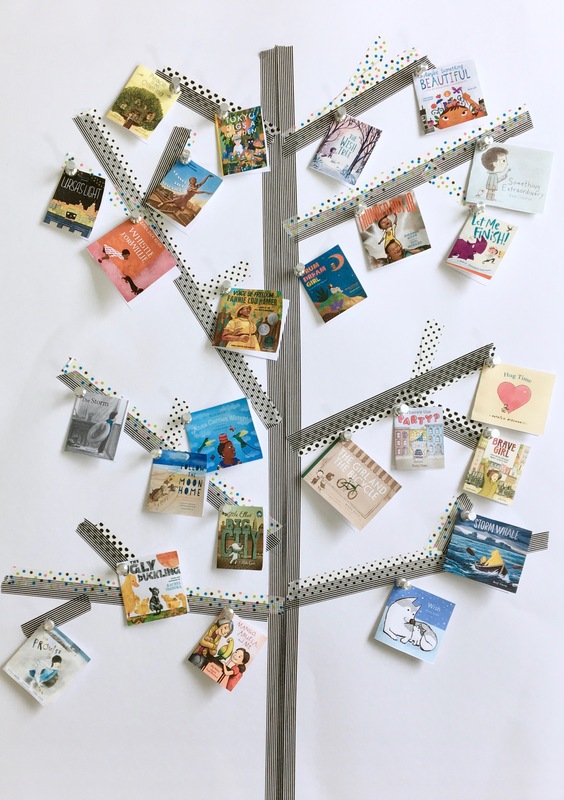 I’ve been fond of wish trees for a long while, so I thought it would be nice to make one for the new year and, inspired by The Wish Tree, one that adds in picture books that touch on the idea of wishing or hoping in some way. 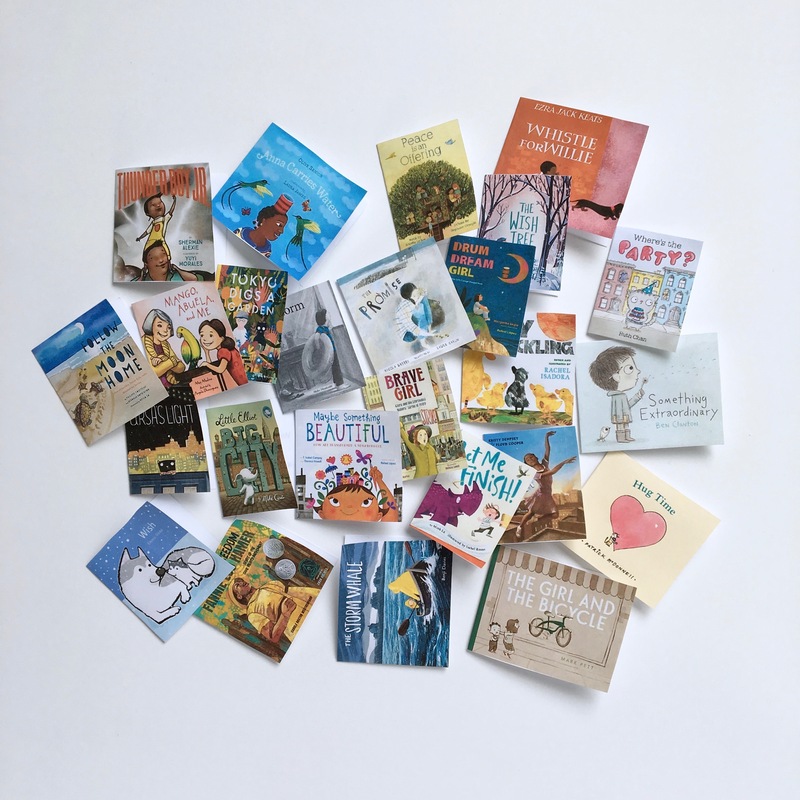 Each of these 25 picture books contains a wish—a hope or dream or undertaking. 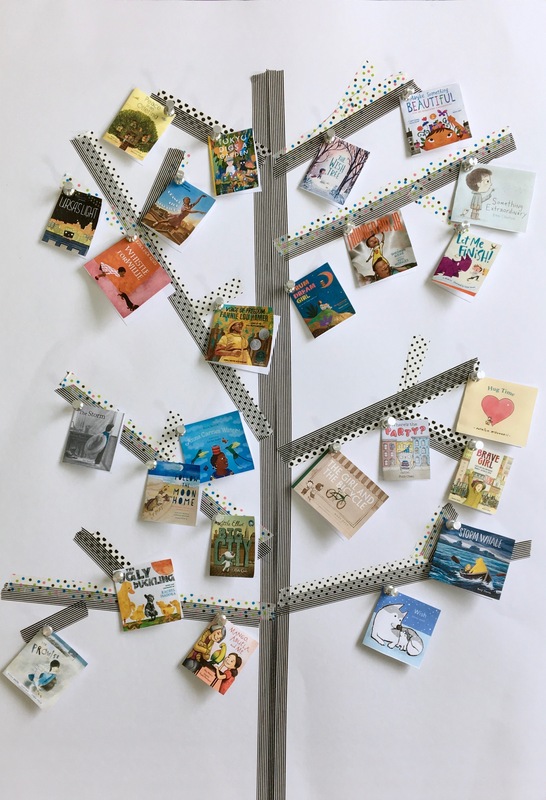 So, in this craft, there’s a prompt for a wish to write inside each book that hangs on the tree, one that goes along with each story, something in line with its spirit. 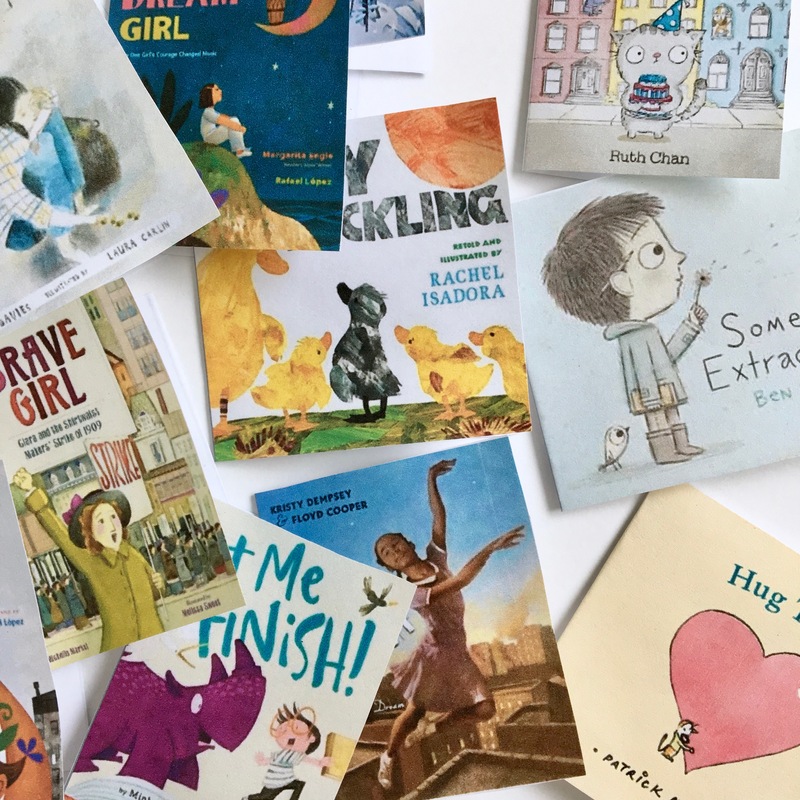 You and your kids or classroom could read one or a few of these books every day, or once a week, or just sometimes. 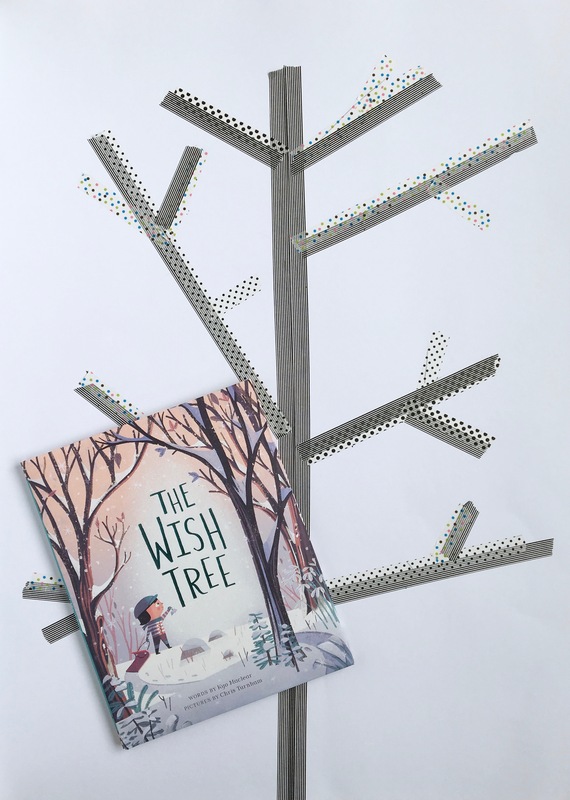 The Wish Tree by Kyo Maclear and Chris Turnham (a wish to find a wish tree): write something kind you would like to do. Whistle for Willie by Ezra Jack Keats (a wish to learn to whistle): write something new you want to learn. Wish by Emma Dodd (a wolf parent’s wishes for their pup): write a wish you have for someone else. 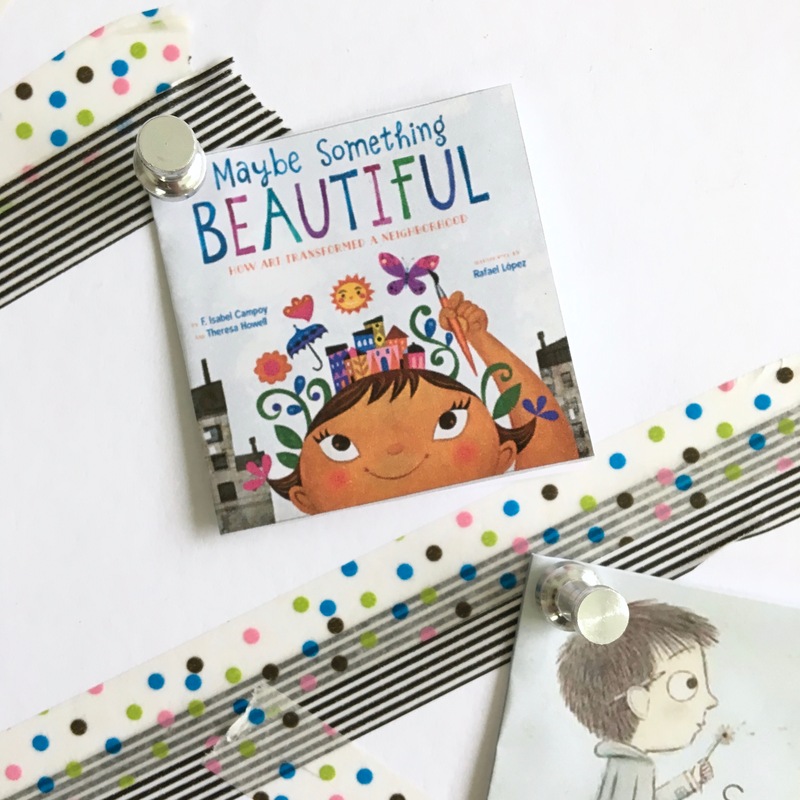 Maybe Something Beautiful by F. Isabel Campoy, illustrated by Rafael López (a wish to create a vibrant and connected neighborhood): draw something to make a space more beautiful and hang it up. Tokyo Digs a Garden by Jon-Erik Lappano and Kellen Hatanaka (a wish for nature): write down a seed you want to plant this year (a literal seed or a different kind of seed). Ursa’s Light by Deborah Marcero (a wish to fly): write down something you’d really like to do someday. Drum Dream Girl by Margarita Engle, illustrated by Rafael López (a wish to be courageous, and to overcome boundaries): write down something you wish to have courage about. Let Me Finish! by Minh Lê, illustrated by Isabel Roxas (a wish to read): write the name of a book you’re excited to read. Thunder Boy Jr. by Sherman Alexie, illustrated by Yuyi Morales (a wish for a name of one’s own while not losing connection to one’s family): make a wish on behalf of someone in your family. 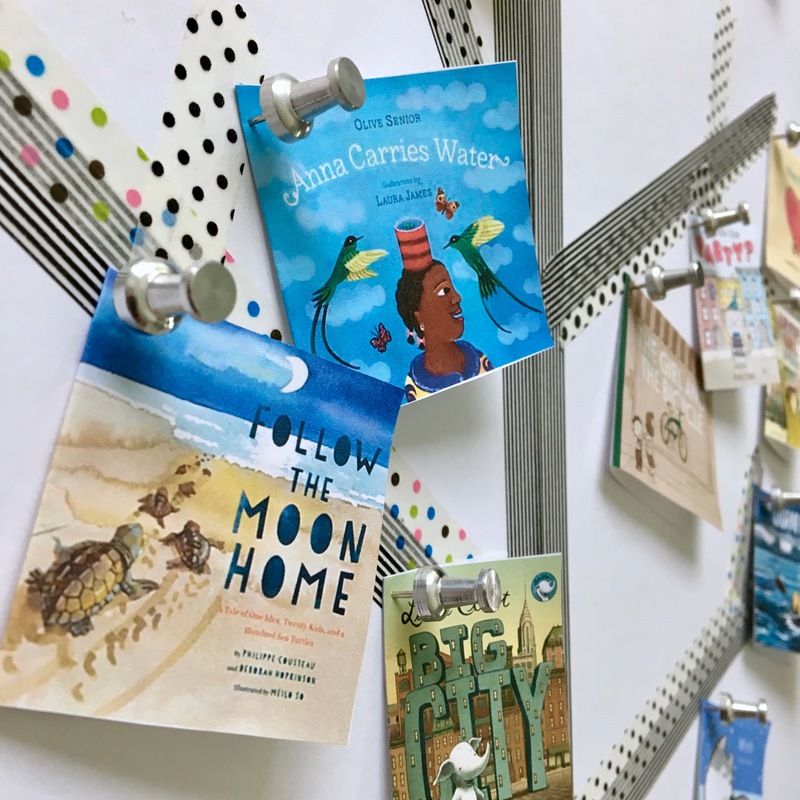 Follow the Moon Home by Philippe Cousteau and Deborah Hopkinson, illustrated by Meilo So (a wish to help turtles find their way home): write down a way you can help animals this year. The Ugly Duckling, illustrated by Rachel Isadora (a wish to belong): write down your favorite place to be. Anna Carries Water by Olive Senior, illustrations by Laura James (a wish to learn to do something new): write down a goal. Peace is an Offering by Annette LeBlox, illustrated by Stephanie Graegin (a wish for peace in the smallest ways): write down an action you can take to help create peace. The Promise by Nicola Davies, illustrated by Laura Carlin (a wish to keep a promise): write down a promise you wish to make to someone or to yourself. Little Elliot, Big City by Mike Curato (a wish to be noticed): write down something you wish to be noticed for—a talent or hard-try. A Dance Like Starlight by Kristy Dempsey, illustrated by Floyd Cooper (a wish, a dream, a hope to dance): write down a dream you wish to come true. Voice of Freedom: Fannie Lou Hamer: The Sprite of the Civil Rights Movement by Carole Boston Weatherford, illustrated by Ekua Holmes (a wish—and lots of brave, brave action—for voting rights): write down a way you wish to speak out about something important. The Storm by Akiko Miyakoshi (a wish for a storm to pass): write down something you wish to happen in the future. Where’s the Party? by Ruth Chan (a wish to have a party with friends): write down a wish for cake (what kind?). Brave Girl by Michelle Markel, illustrated by Melissa Sweet (a wish for and action toward fairness for workers): write down a wish for justice (and perhaps a way you can make the world more fair). The Girl and the Bicycle by Mark Pett (a wish for a bicycle): write down something you have that you’d like to give away. Print the PDF template. Then, cut around the rectangles so you have mini books with front covers and back covers that contain the instructions. Then fold the papers in half so you have miniature books with a cover, a back cover with instructions, and space in the middle of the “book” to write. Finally, pin the books to the tree and tape or prop the tree up somewhere. 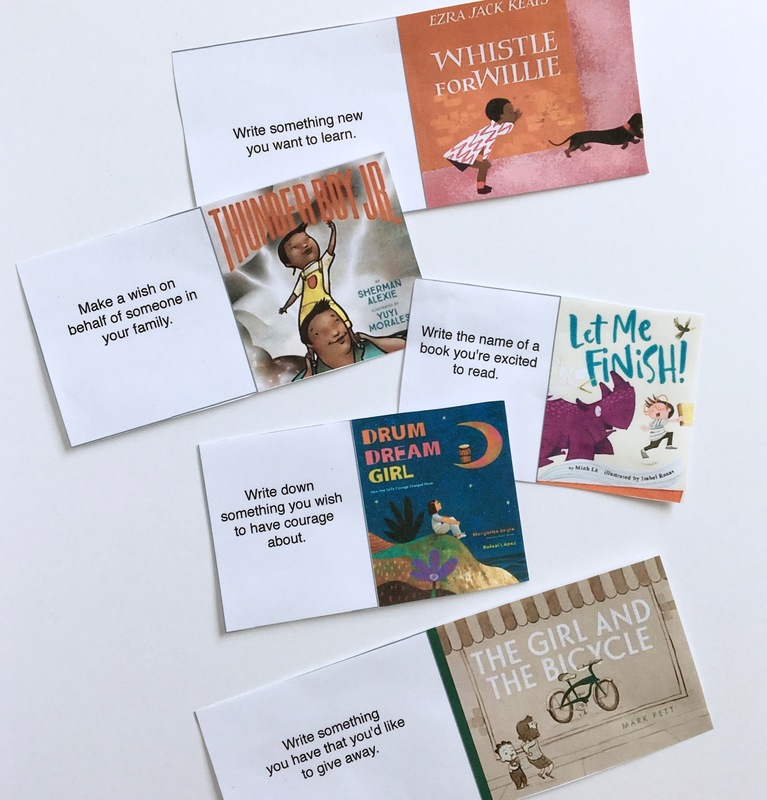 Ideally, you’ll have access to the book/books you’re reading that day and can read the book and then follow with discussion of the wish or hope or undertaking aspect before writing in the mini books. read the books, make a wish tree, make wishes! oh this is LOVELY. I adore the ideas, the books, the wishes, the craft. BEAUTIFUL idea! Many thanks—I’m delighted to hear that! Really impressive collection of wonderful books and lovely way to craft them together. What a beautiful list of books. 2 of my fav wish books are I Wish I had a Pet by Maggie Rudy and Wish: wishing traditions around the world by Roseanne Thong. Also, I have a lovely and true wishing tree story for you. An Australian author-friend of mine was hiking, stumbled onto a wishing tree in the forest, and on the tree was a wish written by a little girl named Pearl for a copy of my friends newest book. My friend Anna desperately wanted to track down this little girl, wracked her brain for how she might find her, and posited that the girl might attend a school near the forest where she’d been hiking. Anna then reached out on Facebook and was able to contact the principal of a school in the vicinity of the forest who connected her with Pearl. Watching the story play out over the message thread on Facebook was thrilling; Anna is a magical sort of person who dearly loves to answer wishes in the best of ways, and Pearl’s wish was beyond fulfilled. Yes! Yoko Ono’s wish tree installations are a sight to see. Truly magnificent. And I love how thoughtfully executed this interactive picture book variation is. What a gift! Thank you for sharing! You have the most brilliant ideas! Great curated list of wish books, too. We hosted Isabel Campoy for Kidquake last fall. She was a wonderful, vibrant speaker. Her book is a reflection of her personality. Lovely. I’m thinking your projects are reflection of your personality as well. 😀 Happy New Year! Oh wow, hearing Isabel Campoy speak must’ve been awesome. And what a great observation about the personality reflected in books/projects. Probably so. 🙂 Happy new year to you, too Jilanne!! As a Mom, an Oma, and an educator, I love this amazing post. Thank you for sharing a unique , creative project. I look forward to creating a PB Wish Tree. Read, write and create every day. Thanks so much, Suzy. I’d be delighted if you made a PB wish tree—hooray!